Remember the old phone slamming scams? Well, this is a similar scam, only it applies to your domain name. “Domain slamming (also known as unauthorized transfers or domain name registration scams) attempts to trick domain owners into switching from their existing registrar to theirs,” wiki definition. 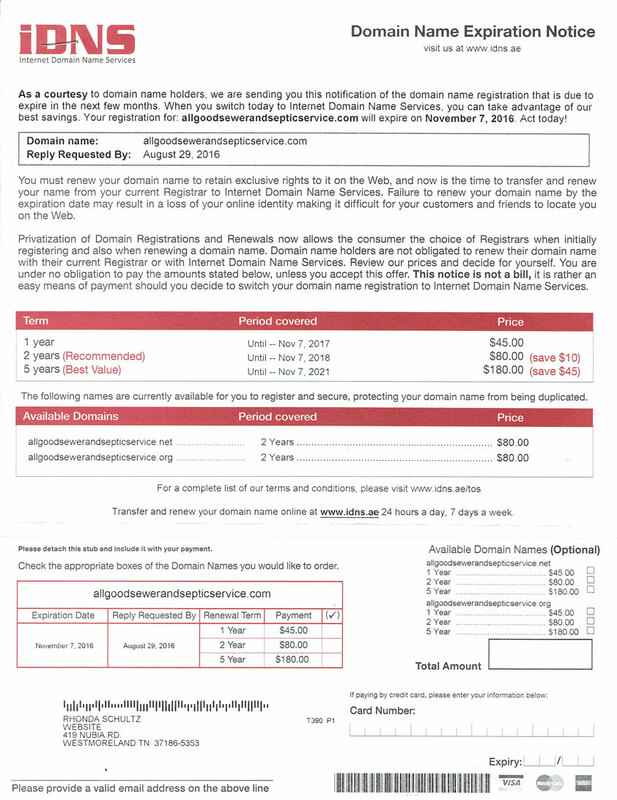 Recently a few clients have received letters, and emails, about domain renewals. The sender calls it a courtesy letter but it looks like an invoice and is confusing to read. The company sending the letter gives the reader the impression they (the sender) owns the domain name, and by signing up now for a multiple year renewal, you will receive a big discount. There is no savings for you or your company. The renewal rates can be as much as 4x more than you would pay your existing registrar. When you fill out this letter and pay them money, you are transferring your domain to them and you are now their customer. This is a letter I recently received. Keep good records, know where to go when it’s time to renew your domain name. Your domain is likely expiring if you received this type of urgent letter, and needs to be renewed. This information is part of public records, which is how these companies get your name and information. Who do you pay for your domain renewal? Pay your current domain registrar, there’s NO need to transfer your domain. To renew your domain go to the website where you purchased it, such as Siteground, Bluehost, GoDaddy, etc. If you are not sure where you purchased your domain name from, or when it expires, go to the public records website whois.icann.org and look up the details. If you are unsure what to do, call us and we will help you sort it out. Don’t fall victim to these companies.